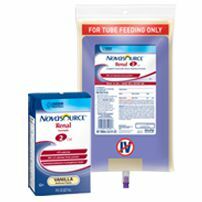 The Nestle Novasource Renal Nutritional Support SpikeRight 1000ml, Model #35180100, is anchored in advanced science and research. Nestle Healthcare Nutrition offers nutritional solutions for people with specific dietary needs related to illness, disease states or the special challenges of different life stages. The Nestle Novasource Renal Nutritional Support SpikeRight 1000 ml is a calorically-dense, complete nutritional formula specifically formulated that provides protein, vitamins and minerals specifically to meet the needs of people with chronic kidney disease (CKD) on dialysis, acute kidney injury (AKI), fluid restrictions due to CKD or AKI, or electrolyte restrictions. Increased protein helps maintain lean muscle.